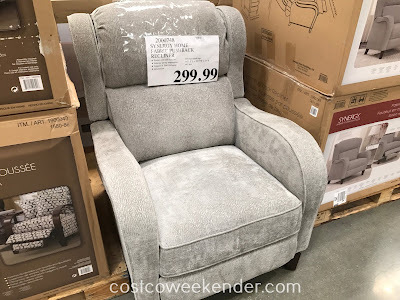 There's nothing like coming home from a long day at work and sitting down on a recliner and just do nothing. 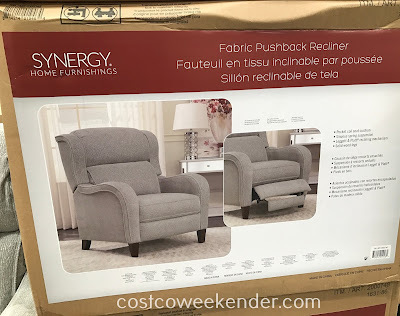 The Synergy Home Furnishings Fabric Pushback Recliner from Costco makes relaxing that much easier. We've seen these recliners before but Synergy Home Furnishings keeps things fresh by changing the look a bit. 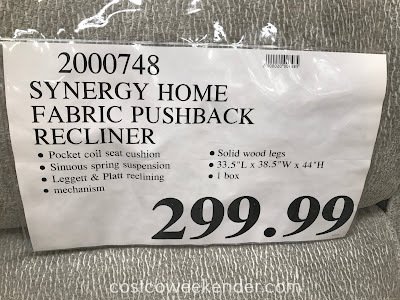 But just like previous versions, the Synergy Home Furnishings Fabric Pushback Recliner comes with the tried and tested Leggett & Platt reclining mechanism. Put your feet up, read a book, watch some TV or even take a nap. Any living room or family room would be ideal for this recliner. Everyone needs their very own go-to spot in the living room. Why not make that the Synergy Home Furnishings Fabric Pushback Recliner.